Kiki Bertens responded to a first-set bagel against Camila Giorgi by claiming a three-set victory, while Julia Goerges made light work of beating Ajla Tomljanovic at the Qatar Open. Dutchwoman Bertens suffered with illness in the build-up to the tournament and fought back from a sluggish start to win 0-6 7-6 (9-7) 6-4 and set up a second-round meeting with Carla Suarez Navarro, who beat Ons Jabeur 6-3 6-1. Goerges joined her in the second round with a 6-2 6-2 win over Tomljanovic, saving all of the eight break points she faced to book a clash with Alison Riske. Simona Halep, Karolina Pliskova, Angelique Kerber and Elina Svitolina are the top four seeds in Doha and they all discovered who their opening matches will be against. 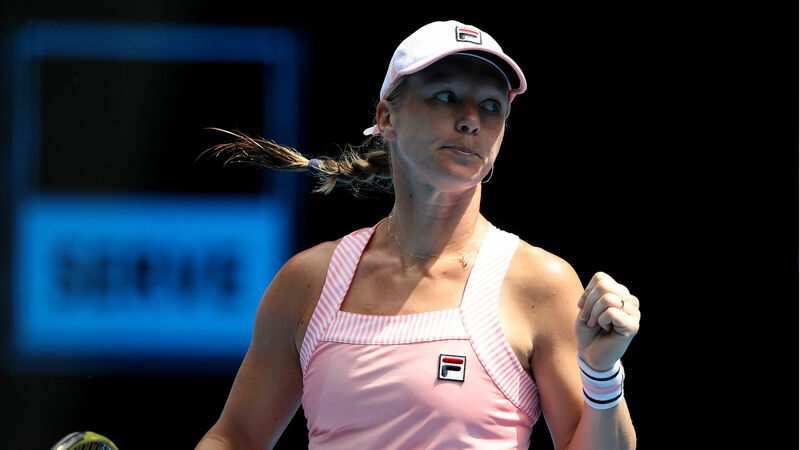 World number eight Bertens had 14 unforced errors to a solitary winner as Giorgi raced through the first set, but she converted her fifth set point in a tense tie-break to force a decider. After taking a 3-0 lead in the third set Bertens had to battle back from a break down and wrestle control from Giorgi once more in order to advance. "Camila started the match today really well, hitting a lot of balls really fast at me, and I didn't control the balls so good," said Bertens, who won the St Petersburg Ladies' Trophy this month. "I felt better than the last few days, but of course you don't have 100 per cent of the energy, but I think I managed to do it pretty well. I'm just happy to be in the second round." Top seed Halep had a bye into the second round and will take on Lesia Tsurenko, who coasted past Lara Arruabarrena 6-3 6-0. Pliskova will face Elise Mertens after the Belgian beat another Czech in the form of Katerina Siniakova 6-4 6-2, while Anett Kontaveit's reward for beating Zhu Lin 7-6 (7-3) 6-3 is a meeting with Kerber. Svitolina's first match is against Jelena Ostapenko. The 2016 runner-up ensured Mihaela Buzarnescu's wait for a first win of 2019 continued with the Latvian sealing a 6-1 4-6 6-2 triumph. Caroline Garcia pulled out of the tournament due to a thigh injury, while Caroline Wozniacki cited a viral illness as her reason for withdrawing. "I played FC [Fed Cup] this weekend and I arrived this morning very early. When I warmed up, I felt pain in my left quad," Garcia said on Tuesday. "I was not feeling comfortable with it and it was getting worse through the practice. I had to play in one hour and it was too short to make any recovery." Karolina Muchova overcame Sam Stosur - added to the main draw after Caroline Wozniacki withdrew - and Hsieh Su-wei also progressed to the next round.